Definition at line 28 of file statusmessage.h. 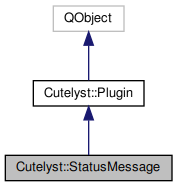 Constructs a new status message object with the given Application parent. Definition at line 52 of file statusmessage.cpp. Definition at line 149 of file statusmessage.cpp. Returns the name of the stash key where error messages are loaded when load() is called. Definition at line 99 of file statusmessage.cpp. Definition at line 162 of file statusmessage.cpp. Load both messages that match the token param (mid=###) into the stash for display by the view. Definition at line 111 of file statusmessage.cpp. References Cutelyst::Session::deleteValues(), Cutelyst::Request::queryParam(), Cutelyst::Context::setStash(), and Cutelyst::Session::value(). Returns the key prefix inside Session where messages will be stored. Definition at line 63 of file statusmessage.cpp. Referenced by error(), setSessionPrefix(), and status(). Sets the name of the stash key where error messages are loaded when load() is called. Defaults to error_msg. Definition at line 105 of file statusmessage.cpp. Sets the key prefix inside Session where messages will be stored. Defaults to "status_msg". Definition at line 69 of file statusmessage.cpp. Sets the name of the stash key where "success" status messages are loaded when load() is called. Defaults to status_msg. Definition at line 93 of file statusmessage.cpp. Sets the name of the URL param that holds the token on the page where you want to retrieve/display the status message. Defaults to "mid". Definition at line 81 of file statusmessage.cpp. Definition at line 205 of file statusmessage.cpp. Definition at line 177 of file statusmessage.cpp. Returns the name of the stash key where "success" status messages are loaded when load() is called. Defaults to status_msg. Definition at line 87 of file statusmessage.cpp. Definition at line 190 of file statusmessage.cpp. Returns the name of the URL param that holds the token on the page where you want to retrieve/display the status message. Definition at line 75 of file statusmessage.cpp.